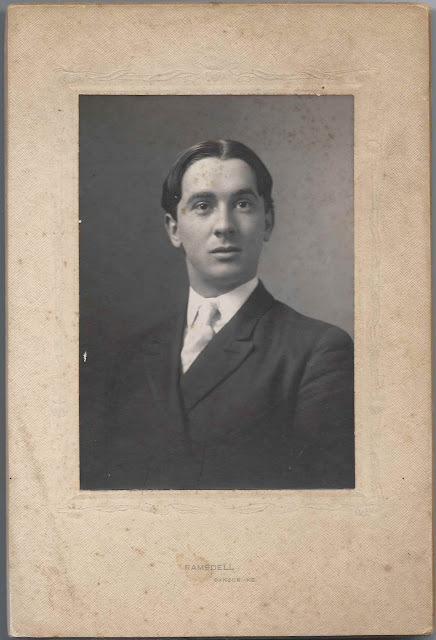 Photograph of a young man identified on the reverse as Arthur Morris. The photograph was taken by the Ramsdell studio of Bangor, Maine. 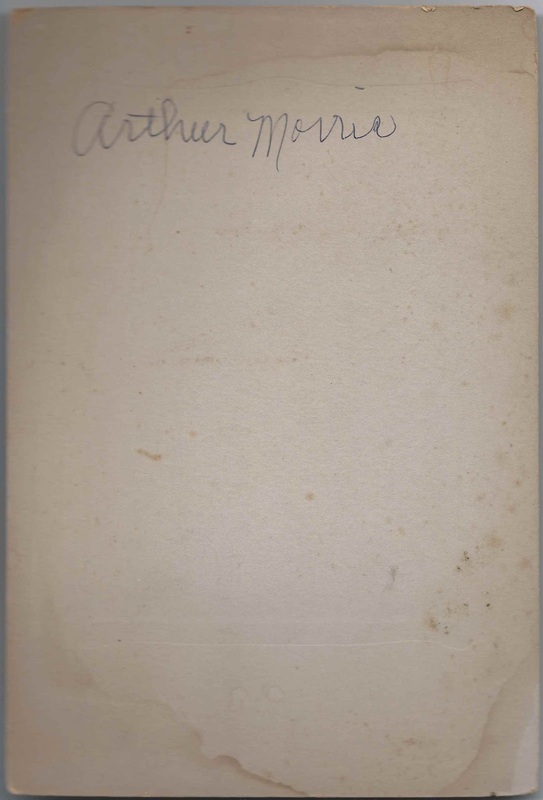 Researching online, I found a likely prospect in Arthur Hayden Morris who attended Bangor Theological Seminary during the 1908-1909 school year. He was born 2 July 1884 at New York City, the date according to his World War I draft registration card, and the date and place according to a listing in a Seminary publication. I believe his parents were James Hayden Morris and Hattie (Dietz) Morris. At the time of the enumeration of the 1900 Census, Arthur and his younger sister Sarah were living with their widowed father at Mount Vernon City, New York. James Hayden Morris was a music teacher and composer. The 1910 Census lists Arthur as boarding at Steuben, Maine with Ada S. Noyes, with the occupation of student. He may have attended Bangor Theological Seminary in 1910 as well. Ada (Stevens) Noyes was the widow of Lendell Boyd Noyes, who died in 1906. Ada, born 11 May 1850 at Steuben, Maine, was the daughter of Henry and Abigail C. (Nash) Stevens. The Penobscot Marine Museum has a photograph of Arthur Morris driving a Model T at Steuben about 1909 or 1910. Arthur's World War I draft registration card shows his occupation to be Farmer. It appears that he helped Ada Noyes run her farm, and he was still doing so at the time of the 1930 Census of Steuben. On 9 August 1930, Arthur married Sadie G. (Stevens) Sumner of Steuben. She was the daughter of Alfred K. and Florence (Rankin) Stevens. Alfred K. Stevens' father, Pillsbury Stevens, was a paternal uncle of Ada (Stevens) Noyes. Sadie was first married to Maurice M. Sumner of Amherst, Maine. The 1940 Census shows the couple living at Stratham, New Hampshire. They weren't easy to find in one of my two go-to genealogy resources, as they were indexed as Auther and Lydia, with Auther's occupation shown as truck driver. A reading of the document itself shows that he was a truck gardener. At Hope Baptist Cemetery in Bradford County, Florida, there's a gravestone of an Arthur H. and Sadie G. Morris, as shown on Find-a-Grave, with Arthur's birth year 1883 rather than 1884. If these are the correct Arthur and Sadie, Arthur died in 1967 and Sadie in 1968. Coincidentally, this photograph was purchased with a few others from a dealer's collection of seemingly unrelated photographs, of which another one had a Steuben connection, showing Olive Cushman Young and Sophia Baker. I'm now wondering how many of the other photographs had a Steuben, Maine, connection. Most were unidentified, but had a studio imprint. I'll contact the dealer. If you have corrections and/or additions to the information above, or if you feel that the Arthur Morris in the photograph is not Arthur Hayden Morris, please leave a comment or contact me directly. Thanks! "With my mother lived my three aunts and small sister, so I early felt my importance as the only "man" in the family. With my father gone it was up to me to take care of my mother and this developed into a serious responsibility, resulting in several years in succession in my using my savings to take my mother on a two-week vacation to various summer resorts as my father had done. One summer's vacation I spent in Maine. A school boy friend, Arthur Morris, had become a Minister and was assigned to a little church in an isolated fishing village just above Bar Harbor, called Steuben. After leaving the train at Bangor, a little single-track branch line seemed to have had its winding track laid so as to curve around larger trees in its path through the thick woods. I was told that a big bull Moose the day before had angrily bucked the locomotive. It killed the moose but also stopped the train." Just a little possible background information on Arthur Morris. Judy, thanks so much for that little gem! I'm feeling better about my suppositions now. Incidentally, I'm familiar with the Maine surname Guiou, last letter u instead of n. Do you suppose they're variants? Pam - Yes, they are. In fact, I've been in contact with Debra Guiou (n) Stufflebean, who has written "A French Huguenot Legacy", which includes various descendant lines, including hers and mine. Neat! This would be good for the Taconnett Falls Genealogy Library at Winslow, Maine, if they don't already have a copy. Will check. Pan - And to think, without the internet, we wouldn't have ever connected ! !